Julio Cesar Chavez Jr. is being moved along slowly -- and his promoter wouldn't have it any other way. Junior middleweight Julio Cesar Chavez Jr. is undefeated in 39 fights and has a loyal fan base in Mexico and a passionate following among Mexican-Americans, which is the reason he's headlined several pay-per-view cards despite facing, to be nice, soft opposition. Yet even with so many fights, Top Rank's Bob Arum and Zanfer's Fernando Beltran, Chavez's co-promoters, are in no particular hurry to move the son of Mexico's greatest boxing icon, Julio Cesar Chavez Sr., into a fight with a top contender. They don't yet see a reason. "As long as he's entertaining and in competitive fights, there is no hurry," Arum said. "When he ceases to be entertaining and the fights become one-way blowouts or the fans stop supporting him, then we have to move him up. We'll move him up in the later part of the year, but right now we are content to do things the way we've been doing them." The way they've been doing things is for Chavez (38-0-1, 29 KOs) to fight once per quarter headlining pay-per-views from different places in Mexico. Although Chavez's opponents are not well known -- Matt Vanda, Giuseppe Loriga, Jose Celaya and Ray Sanchez are not exactly murderers' row -- Arum says he has requests from more cities in Mexico wanting to host a Chavez fight than he can accommodate. That gives Arum and Beltran license to match Chavez with not-so-threatening opponents. 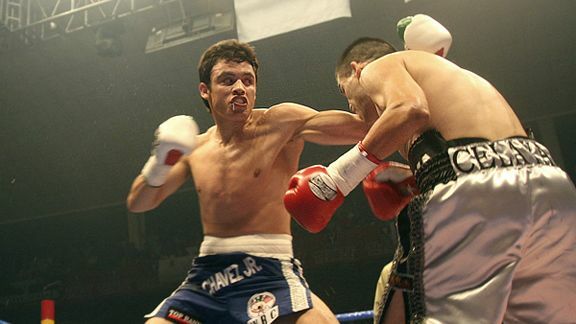 Like father, like son: Julio Cesar Chavez Jr. is widely popular in Mexico. "These are hugely successful shows. They have huge support in Mexico," Arum said. "That means that people want to watch them. We sell out buildings all over Mexico and do really nice numbers on pay-per-view [in the United States]. It's the public that's buying these shows and we'll keep doing them as long as they stay interested in them." The latest stop on the Chavez gravy train comes Saturday night (Top Rank PPV, 9 ET), when he faces obscure Luciano Cuello (23-0, 9 KOs) in the headline fight of a four-bout telecast at the 22,000-seat Plaza de Toros Monumental bullring in Tijuana, where the government is involved in the fight and fans will be admitted free. Although there are world title bouts on the card featuring junior lightweight Humberto Soto and bantamweight Fernando Montiel, two of Mexico's finest active boxers, Chavez generates the buzz. Chavez, though, is getting a little itchy to step up his level of competition. "I feel that [my career] has gone very well," Chavez said. "I had time to learn and to make myself a better fighter. But like everyone else, I want to see myself against tougher opposition and see what I can do. Like every fighter, I want to be a world champion and I truly feel that I'm ready to face a higher level of opponent. I'd like to fight for a world championship this year." Arum said although he believes Chavez may eventually develop into a world-class fighter, he won't be pushed to put him in a fight he can't handle. "His two fights with Vanda [in '08] were both really good, entertaining fights," Arum said of Chavez's decision wins. "If he knocked Vanda out in the first or second round, then you'd think about moving him up. But you continue on the path. The fans liked the fights and they were competitive. I wouldn't schedule a whole series of first- or second-round Chavez knockouts because that would be a disservice to Chavez as well as to the audience. But as long as he's competitive and he makes entertaining fights with the opponents we're matching him with, you continue doing it." In other words, Arum, who admits he's making good money on these shows, doesn't want to fix what ain't broke. He points to Chavez's lack of amateur experience as a reason why he's moving him so slowly. That and because he's only 23, although Arum doubts that. "He's supposedly 23 but I don't believe it," he said. "I think he's younger. I think he's 21. I don't think his birth certificate was real when he turned pro. He's just beginning to grow into his body." If Chavez is successful Saturday, Arum said the show will roll on in July with another fight in Mexico. In the fall, Arum said he will consider stepping him up. He has let Golden Boy Promotions know that Chavez is available to face Oscar De La Hoya if he elects to fight again. "If there is no De La Hoya fight, Chavez will fight someone like John Duddy, which will be a step up but a good fight and not a killer," Arum said. "Chavez is a kid I think can be a world-class fighter but if I was saying he was a world-class fighter now and then it wouldn't be truth in advertising. Julio is happy with the way things are right now, but he's beginning to show a little impatience." Chavez, of course, would love to face De La Hoya, who stopped his father in two TKO victories, the first to win the junior welterweight title and the second to retain the welterweight championship. "But just to clear something up -- I'm not chasing Oscar De La Hoya," Chavez said. "I would like to face him, of course, but if he's not interested so be it. "I believe the Mexican fans would love to see me fight De La Hoya because of the history with my father, and it would be a dream come true for me. But if it doesn't happen it is not the end of the world. He was a great champion and to fight against him would be great for the fans and, after all, that's why we fight, for the fans." Even if he doesn't get a chance to face De La Hoya, Chavez still wants to step up his competition after Saturday. "There are many fighters out there that I like to face from [titlist] Vernon Forrest on down," he said. "But in order to do that I have to not only win on Saturday, but do it well enough to show Fernando Beltran and Top Rank that I'm ready for bigger challenges." Chavez may be ready, but are his promoters? 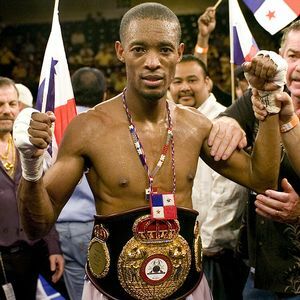 Junior featherweight titleholder Celestino Caballero (31-2, 22 KOs), who blew out Steve Molitor in four rounds on Showtime's "ShoBox" to unify 122-pound belts in November, was due to return to the network to defend April 24 against mandatory challenger Jeffrey Mathebula (22-1-2, 12 KOs) of South Africa. However, there has been a change of plans. Caballero was supposed to headline at the Hard Rock resort in Hollywood, Fla., but that was before the government of his native Panama stepped up and made him a far more lucrative offer. The fight will still take place April 24, but in Panama City without Showtime coverage. Celestino Caballero would rather fight in Panama City for more pay than fight in Hollywood, Fla., with televised coverage. To replace the fight, Showtime is working out a deal with promoter Don King to air Cory Spinks against Deandre Latimore for a vacant junior middleweight belt from St. Louis, their hometown, King spokesman Alan Hopper told ESPN.com. Junior welterweight prospect Devon Alexander, also of St. Louis, will also fight. Initially, King and co-promoter Lou DiBella were planning the card for May 2 without television, but with Showtime interested, they're happy to move the fight up one week, Hopper said. As for Caballero, "He's fighting in Panama because the government offered more money than I could pay him. He's going to make about three times the money, so what can I do," said Seminole Warriors Boxing promoter Leon Margules. "I'm upset about it because my casino wanted the show and Showtime wanted him on the network." However, Margules found a silver lining. Had the show gone on, his company would have lost between $30,000 and $50,000, he said. "I was basically doing the card and going to take the loss as part of my deal with the fighter and as part of him signing an [18-month] extension with me," Margules said. "Now, I'm off the hook and he still signed the extension." • Junior welterweight titleholder Juan Urango wants more money or he won't take a fight with welterweight titlist Andre Berto, which is supposed to headline a May 30 HBO card at the Hard Rock in Hollywood, Fla. The fight was in jeopardy Thursday when Urango changed his mind, according Seminole Warriors Boxing promoter Leon Margules. Margules said he made a deal for $300,000 with Berto promoter Lou DiBella. Under Margules' 70-30 deal with Urango, the fighter would receive $210,000. When HBO slashed its fee to DiBella, he cut the fee to Warriors to $275,000, although Margules said he would eat the difference and still pay Urango $210,000. However, Margules said Urango's attorney called him Thursday and said Urango wanted $300,000. However, Friday morning Margules said he was hopeful that he'd be able to work a new deal with Urango if he could secure "a few more dollars" from DiBella/HBO. If the fight isn't repaired, it will leave DiBella looking for a replacement to fight at a backup site in Palm Springs, Calif. However, if Urango falls out, HBO prefers Berto to face Zab Judah or Carlos Quintana while the Berto camp wants Delvin Rodriguez, a fighter HBO has no interest in. • Kelly Pavlik's middleweight title defense against Sergio Mora will take place June 27 at Boardwalk Hall in Atlantic City, N.J., Top Rank promoter Bob Arum told ESPN.com. Arum said that although he had originally considered doing a split-site telecast with Pavlik in Atlantic City and other bouts from Mexico, the card will emanate entirely from Boardwalk Hall. Arum's initial thoughts for the undercard include bouts involving junior welterweight contender Mike Alvarado (perhaps against Paulie Malignaggi), junior middleweight prospect Vanes Martirosyan and middleweight prospect Matvey Korobov. The other title bout Arum wants to do would pit bantamweight Fernando Montiel against Eric Morel. That would be contingent on Montiel claiming a vacant interim title Saturday night against Diego Silva. • Arum has sung this song before but he's singing it again: If Pavlik beats Mora and middleweight titlist Arthur Abraham wins a summer bout they could meet in the fall. Arum said he's talking to Abraham promoter Sauerland Event about the showdown between the world's top 160-pounders. "We're working on it," Arum told ESPN.com. "Kelly will fight Mora and Abraham has a fight this summer. Then hopefully we can bring them together. Abraham wants it and the Pavlik people say they can't wait to do the fight." Arum wants it on HBO or Showtime, not on pay-per-view. "We'll try to do it on one of the networks," Arum said. "It's the fight that all the sportswriters [want]. It's probably the most enticing fight conceivable for premium cable." • Junior middleweight titlist Vernon Forrest (41-3, 29 KOs), who owes a mandatory defense to Sergio Martinez but has been avoiding him for months, will face instead Jason LeHoullier (21-1-1, 8 KOs) in a nontitle fight April 24. Forrest will fight LeHoullier, 0-1-1 in his past two bouts, on the undercard of the Carl Froch-Jermain Taylor super middleweight title bout at the Foxwoods resort in Mashantucket, Conn., Forrest promoter Gary Shaw told ESPN.com. According to Showtime, the 10-rounder will air as the opener on a tripleheader that also includes super middleweight Alan Green against Carlos De Leon Jr.
• Forrest's camp had been in talks with middleweight titlist Abraham for a June fight on Showtime, but they fizzled, leading Forrest to take the April 24 bout. Abraham, meantime, instead plans to fight this summer in Germany against Giovanni Lorenzo, his mandatory challenger. "We've been discussing the fight with [Sauerland Event's] Chris Meyer. Giovanni is excited to get his opportunity to fight for a world title," Main Events' Kathy Duva, Lorenzo's promoter, told ESPN.com. • The deal being negotiated for the past couple of months between ESPN and Golden Boy, which would result in Golden Boy having at least seven of the remaining dates on ESPN2's "Friday Night Fights" this season -- and possibly an eighth with options for a slew of dates next year -- was finally agreed to Wednesday. One of the keys to the deal is Golden Boy helping secure a significant sponsor package from beer maker Tecate. Golden Boy's first card under the deal is April 10, when junior middleweight David Lopez faces Ossie Duran in Tucson, Ariz. The second show is April 24 in Chicago. Junior featherweights Antonio Escalante and Gary Stark meet in the main event. • Featherweight Gary Russell (2-0), a 2008 U.S. Olympian, was supposed to open a "ShoBox" tripleheader in Miami, Okla., Saturday night (Showtime, 11 ET/PT), but he withdrew because of illness. Super middleweight Andre Dirrell (17-0, 12 KOs), a 2004 U.S. Olympic bronze medalist, faces Derrick Findley (13-2, 8 KOs) in the main event and junior middleweight Ronald Hearns (21-0, 17 KOs) faces Harry Joe Yorgey (21-0-1, 9 KOs) in the opener. • The Klitschko brothers may not be able to gain much traction in the U.S., but the heavyweight title-holding brothers are stars in Germany, their adopted home country. Vitali Klitschko's title defense last Saturday, a ninth-round knockout of Juan Carlos Gomez in Stuttgart, was a huge hit in Germany. Besides a sellout crowd of 12,500, an astonishing 11.5 million television viewers watched it on RTL. That translates to 55 percent of the people watching TV at that time in Germany, Team Klitschko announced. To put it in perspective, HBO's Feb. 28 broadcast of the Juan Manuel Marquez-Juan Diaz lightweight championship fight drew about 1.6 million viewers in the U.S.
• Golden Boy doesn't promote Julio Diaz, so it considered dropping the ex-lightweight titlist from its April 4 "Lightweight Lightning" pay-per-view card after former champ Joel Casamayor, whom it does promote, withdrew because with a back injury. However, Golden Boy decided it was only right to keep Diaz (36-4, 26 KOs) on the card and signed Rolando Reyes (30-4-2, 19 KOs) as a replacement. Also on the card in Austin, Texas: Edwin Valero fights Antonio Pitalua for a vacant lightweight belt; hometown fighter Jesus Chavez faces Michael Katsidis; and Carlos Hernandez meets Vicente Escobedo. • Former junior featherweight titlist Steve Molitor is ready to return following his fourth-round knockout loss to Celestino Caballero in a November unification bout. Molitor was ringside at Ontario's Casino Rama last Friday to watch Heriberto Ruiz win a decision against former bantamweight belt holder Mauricio Martinez, a victory that earned Ruiz a fight with Molitor on June 26 back at Casino Rama, Molitor's base. • Former junior welterweight titlist Diobelys Hurtado, who had memorable fights with Kostya Tszyu and Pernell Whitaker, is making a comeback. Hurtado, 36, a Cuban defector who has most recently been living in Spain, will return to the United States to face Arturo Morua (25-11-1, 14 KOs) in Miami on April 3 (Telemundo) for his first bout in 13 months. Hurtado retired in 2004 before taking a pair of six-rounders, in late 2007 and early 2008. • Former junior lightweight belt holder Mike Anchondo (27-2, 19 KOs) will end a two-year retirement when he returns April 16 to face Hector Alatorre (15-6, 5 KOs) in a six-round bout at 142 pounds at the San Manuel Indian Bingo and Casino in Highland, Calif. Anchondo, who turns 27 the day before the fight, hasn't fought since being stopped in three rounds by Darling Jimenez on April 27, 2007. Anchondo briefly held a 130-pound title but lost it on the scales when he didn't make weight for his first defense against Jorge Barrios, who stopped Anchondo in four rounds to win the vacated title in April 2005. "To be honest, I didn't know who Carl Froch was. I would tell people all the time here in the States that I was fighting Carl Froch and everybody was saying, 'Who?' It was kind of embarrassing.